These cottage accommodations are located throughout the area in Grand Isle. Situated in Grand Isle, this vacation home is close to Rotary Park, Grand Isle Butterfly Dome, and Grand Isle State Park. We had a great stay on Grand Isle - just keep in mind, this is meant to be a rustic cottage setting, not a 5 star hotel. Beds are not the most comfortable, but the place was clean and the staff super friendly. This is a clean well maintained house. We stayed a few days while fishing and will be back. Where to find Grand Isle hotels near an airport? Where can I find hotels in Grand Isle that are near tourist attractions? If you intend to stay in Grand Isle, be sure to pre-plan, because you won't find a lot of accommodation choices in close proximity to Grand Isle's heart. 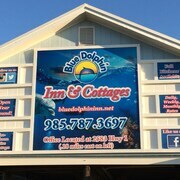 The Blue Dolphin Inn and Cottages is amongst the most conveniently situated accommodation options because it is one of only a small number of options within an easy stroll of the Grand Isle center. The Blue Dolphin Inn and Cottages is located 2 kilometres (1 mile) away from the heart of Grand Isle. An alternative is the GoMotel Port Fourchon, which is 25 kilometres (15 miles) away. Keen on seeing more of the streams and wetlands this area features? Why not book some time in some of the other places in Southern Louisiana? Whether you engage in popular local activities, for example shore fishing, or just travel around to see the attractions, you will be able to find comfortable places to stay in the vicinity. 80 kilometres (50 miles) from Grand Isle is Houma, which features the Southland Mall. Houma has a range of good places to spend the night. If you have enough time, why not visit Houma, which is home to the Williams Avenue Recreation Center. Houma is situated 80 kilometres (50 miles) to the northwest of Grand Isle. The Fairfield Inn by Marriott Houma and Hampton Inn Houma are comfortable places to stay in Houma. Before you head home, consider spending a few hours rubbing shoulders with fellow sports fans at a local game. Mercedes-Benz Superdome is 80 kilometres (50 miles) to the north of Grand Isle. Sports fans wishing to stay close by can make a choice from the Windsor Court Hotel or the W New Orleans - French Quarter. Louis Armstrong New Orleans International Airport is a nearby airport for flying into and leaving Grand Isle. It is 85 kilometres (54 miles) drive away. If you would like to stay nearby, try the Hilton New Orleans Airport or Crowne Plaza New Orleans Airport. What are the most popular Grand Isle hotels? Newly Constructed, Luxurious Vacation Home!! Are there hotels in other cities near Grand Isle? 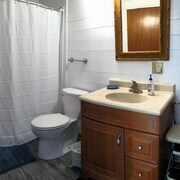 What other types of accommodations are available in Grand Isle? Explore Grand Isle with Expedia.ca’s Travel Guides to find the best flights, cars, holiday packages and more!